So the other day I found myself with an overabundance of Spring vegetables and wasn’t sure whatt o do with them. 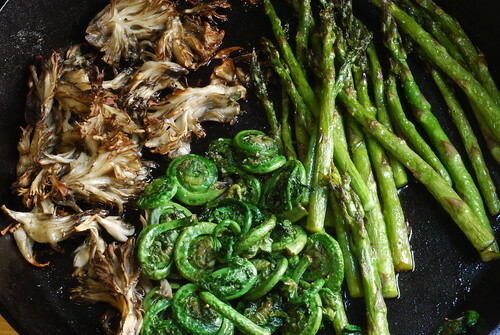 Then it hit me — intensify the flavors by roasting them. 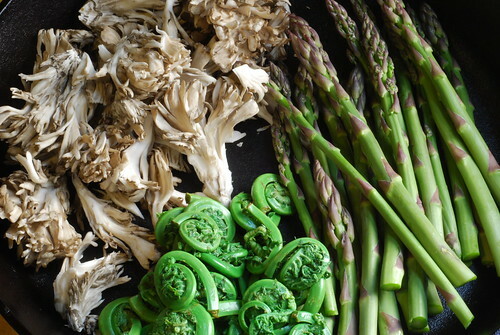 I blanched and shocked the fiddlehead ferns, trimmed the ends of the asparagus, and cut the hen of the woods mushroom into bite-sized pieces. Then I loaded them all into my cast iron skillet, sprinkled with olive oil, salt and pepper, and roasted them in the oven at 500 degrees for about half an hour. The results may not be quite as pretty as the pre-cooked vegetables, but they’re incredibly flavorful. What to do with them? You could eat them as is, maybe with a sprinkle of parmesan cheese. Or you could add them to an omelet. Or you could do what I did and cook up some pasta, toss it with some olive oil, butter, lemon, and spring onion, then add the roasted veggies. 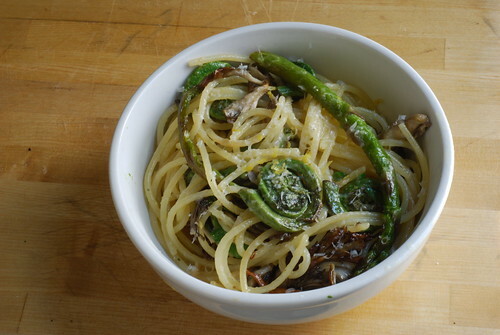 Top with lemon zest and parmesan and enjoy!